Donauhomes consists of two separate buildings directly next to the Old Danube and the Donauinsel. This great location has led us to call this great home Donauhomes - short DOHO. One of the buildings is called DO, the other one HO. The DO and HO buildings both have the same great features such as a common room, laundry room and – unique in Vienna – storage rooms. You will find big rooms – most of them including a balcony, loggia or terrace - amazing views and friendly people in both buildings. And all that for a very convenient All-in Rent! You are directly next to a U2 Subway Station as well as multiple free time activities. There’s a Wakeboard Lift and a Stand-Up Paddling Club within a few meters, the Vienna City Beach Club is close by, the Donauinsel is directly in front of DOHO, and numerous beaches are present along the Old Danube. Every unit has an extra storage room in the basement – no more trouble storing your suitcases or mountain bikes. Common rooms with 40m² for study sessions with friends or intense discussions with your colleagues. DOHO offers you 164 secured bike spots and 17 parking lots (available upon request). Further parking can be found at the Park+Ride nextdoor. Enjoy cleaning your dirty laundry in our modern laundry rooms with high-end equipment! In addition to sport and relaxation being so close to DOHO, Uni is not far away but still far enough. From DOHO's location in the green area of Vienna around the Old Danube, you can reach Uni within a few minutes. WU, TU and Hauptuni are perfectly accessible without changing lines. 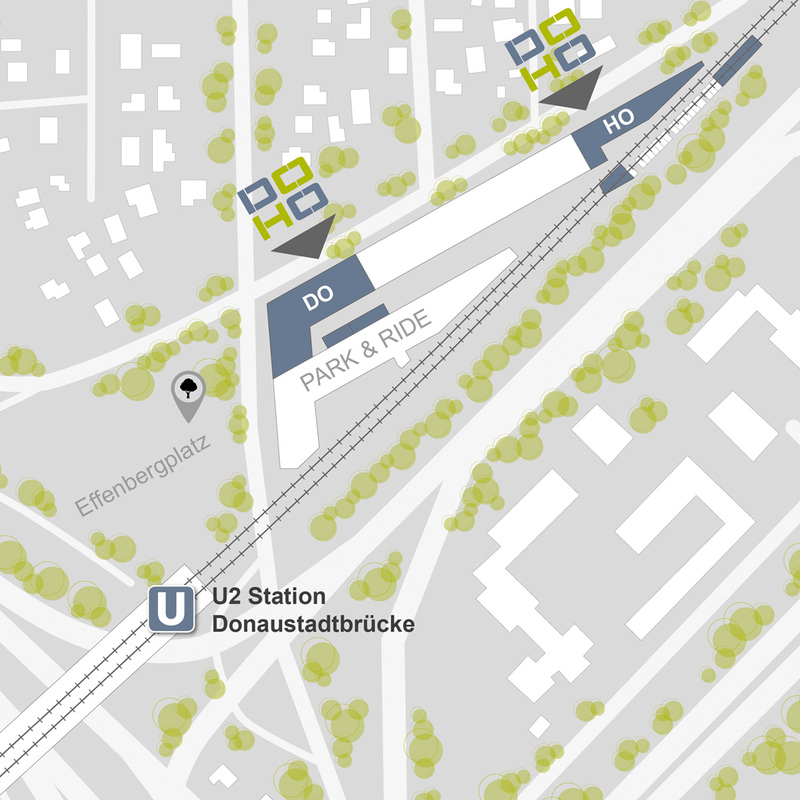 The U2 Station Donaustadtbrücke is located directly in front of DOHO, which offers you access to every corner in Vienna. If you prefer to move around by bike or car, parking spaces are available at DOHO upon request. Plus there is also a Park&Ride Parking Lot directly next to DOHO with affordable parking fees.